Energy Transfer Partners, the Texas-based pipeline operator that owns the controversial Dakota Access Pipeline, is coming under renewed scrutiny for two spills that released more than 2 million gallons of drilling fluid into Ohio wetlands earlier this month. A violation notice made public this week indicates about 50,000 gallons of drilling fluid — a thick gel-like substance used to cut through rock during pipeline construction — was released near Richland County, Ohio. The spill was discovered April 14, according to the Ohio Environmental Protection Agency. An estimated 2 million gallons spilled in another incident discovered April 13 near the Tuscarawas River south of Navarre. Both spills were connected to the company’s construction of the Rover Pipeline, a $4.2 billion dollar project that will route through Ohio, Pennsylvania, West Virginia, Michigan and Ontario, Canada. Energy Transfer Partners said the Richland County leak has been completely cleaned up. “We are currently working to complete the cleanup at the other site in Stark County and anticipate returning to construction shortly,” Alexis Daniel, a spokesperson for Energy Transfer Partners, told NewsHour. Daniel said the leak was “not harmful to the environment,” but an Ohio Environmental Protection Agency filing notes the spills “impacted water quality.” Both spills contain “bentonite,” a mineral used to help cat litter clump when it gets wet and does not break down easily in water, making it difficult to remove large clumps from aquifers. Construction on the Rover Pipeline began two weeks ago after the Federal Energy Regulatory Commission (FERC), which controls the natural gas industry, granted Energy Transfer Partners a permit in February. According to Energy Transfer’s website, the pipeline is scheduled to be ready for service in by mid-2017. Once completed, the Rover Pipeline will transport up to 3.25 billion cubic feet of natural gas per day to markets in the Midwest, Northeast, and Canada, with direct deliveries to Ohio. The Dakota Access Pipeline was halted by the Obama administration after concerns from Standing Rock Sioux and other Native American tribes said the pipeline threatened tribal drinking water. Three days into his presidency, Trump reinstated DAPL, which is now laid underneath Lake Oahe. Energy Transfer CEO Kelcy Warren told NewsHour pipeline approvals would happen after Inauguration Day. Trump, considered friendly to the oil and gas industry, said he planned to expedite environmental reviews — including the one that allowed DAPL to move forward Trump also gave the green light to the Keystone XL pipeline, a project Obama had also rejected in 2015. “The process is so long and cumbersome that they give up before the end. Sometimes it takes many, many years and we don’t want that to happen,” Trump said while signing an executive order in January. Democratic lawmakers, including Massachusetts Sens. Elizabeth Warren and Ed Markey, are urging the government step in to stop construction of other FERC approved pipelines across the country. 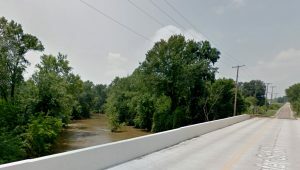 Left: A screengrab from Google Maps shows the Tuscarawas River just outside of Navarre, Ohio.